International Enexco Ltd. (TSX-V: IEC) has released drill results from the Mann Lake uranium project in the Athabasca basin of Saskatchewan, operated by Cameco Corp (TSX: CCO). Down-hole gamma survey results in drill hole MN-060 (see "Table A") intersected 5.1 metres ("m") averaging 2.31% eU3O8, from 687.6m to 692.7m. The intersection includes a 0.4m interval, from 691.2m to 691.6m, averaging 10.92% eU3O8. The hole represents a new discovery footwall to the western conductor in the northern half of the Mann Lake property and is located 300m south of hole MN-047, drilled in 2013, which encountered elevated radioactivity. The Company holds a 30% interest in the project along with Cameco (52.5%) and AREVA (17.5%). The intersection is the best returned in terms of thickness and grade from the Mann Lake property thus far, and accordingly, the 2014 three rig Winter Drill Program is being modified by Cameco to follow up on these results both along and across strike. A wedge hole from MN-060 is currently being drilled. 1) eU3O8 is the radiometric equivalent uranium from a total gamma down-hole probe calibrated using an algorithm calculated from the comparison of probe results. True widths of mineralized intervals have not yet been determined or geochemical analyses performed to support the probe data. (2) Average grades are composited from 5 centimetre intervals. Arnold Armstrong, President and CEO of Enexco, commented: "We are extremely excited by the strong mineralized intercept from hole MN-060 at Mann Lake. This is one of most prospective areas of the eastern Athabasca Basin, and we look forward to receiving further results throughout the ongoing drill campaign. Arnold Armstrong, President and CEO of Enexco, commented: "We are extremely excited by the strong mineralized intercept from hole MN-060 at Mann Lake. This is one of most prospective areas of the eastern Athabasca Basin, and we look forward to receiving further results throughout the ongoing drill campaign." MN-060 is the eighth hole drilled in the 2014 program targeting the C conductor a six-kilometre-long section of an anomalous regional trend. The C conductor on the Mann Lake property consists of three geophysical conductors designated the eastern, central and western conductors. Hole MN-060 was collared 300m south of 2013 hole MN-047, the initial test of the area footwall to the western conductor. MN-047 encountered mineralization at similar depths below an unconformity in semipelite, with 0.7m of 0.114% eU3O8, from 693.8m to 694.5m, and 2.0m of 0.272% eU3O8, from 696.0m to 698.0m. The 2014, three-rig drill program on Mann Lake was planned as an 18-hole, 13,000 metre program. To date 8 holes have been completed, and 2 are in progress. The drill program is expected to be complete by early April. Drilling is still underway. 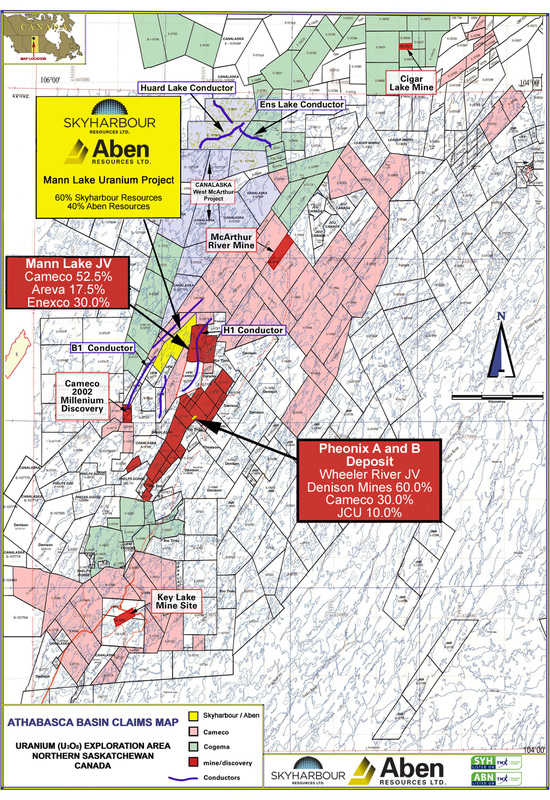 A presentation on the Mann Lake Uranium Project can be found on the Company's website. William Willoughby, Ph.D., P.E. is the Company's Qualified Person for the purposes of National Instrument 43-101 and has prepared or supervised the preparation of the disclosure of any scientific and technical information contained in this news release. The Mann Lake Uranium Project is located in the heart of what is indisputably the most prolific and highest grade uranium region in the world, the Athabasca Basin in Saskatchewan. The Project lies 25 kilometres southwest from Cameco's McArthur River Mine and is 20 kilometres northeast of Cameco's Millennium deposit. High-grade mineralization was intersected during the 2006 drill program in drill hole MN-013 which intersected 7.12% U3O8 over 0.25 metres and 5.53% U3O8 over 0.4 metres in the basement, 12 metres beneath the Athabasca unconformity surface.